I received a long-awaited shipment on Wednesday, two new Equus Leather belts. As many of you have probably noticed I mostly wear their belts on a day-to-day basis. Actually, the only belts not from them are either suede or canvas. Now, there is a reason for that. Since I bought my first belts from EL, I've been very impressed by the quality and beauty of these belts. Before this box arrived this week, I had three of their belts. One in Australian Nut, London Tan and Dark Havana. Especially the belt in Australian Nut has been in very heavy use, and must have at least 500-600 wears behind it basically still looking like it was new. 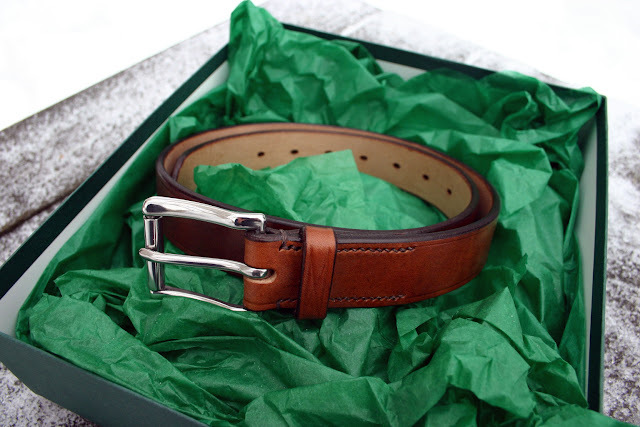 So, to fill some holes in my belt collection, this week's arrivals included a black bridle leather belt, and something I had been anticipating especially, a new color and leather addition to Equus Leather's selection, an Oak Brown oak bark tanned bridle leather belt. The belts arrived as last time, beautifully gift wrapped and with a handwritten card. 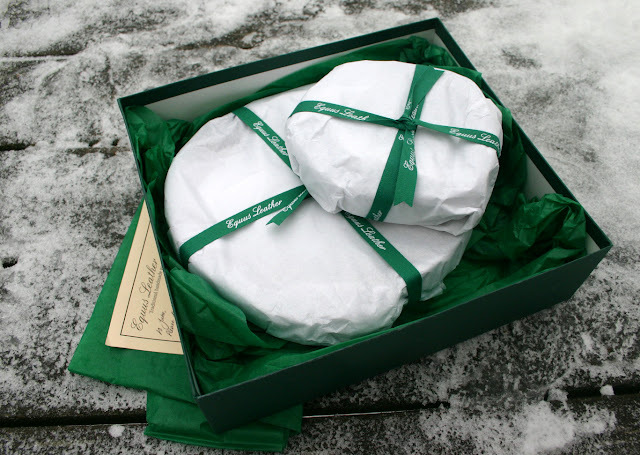 These are also things that you rarely see in the modern world, and just add to the great luxurious feeling you get from buying totally handmade quality products. This is the black belt. I opted for black stiching, as I felt it would suit my taste better. 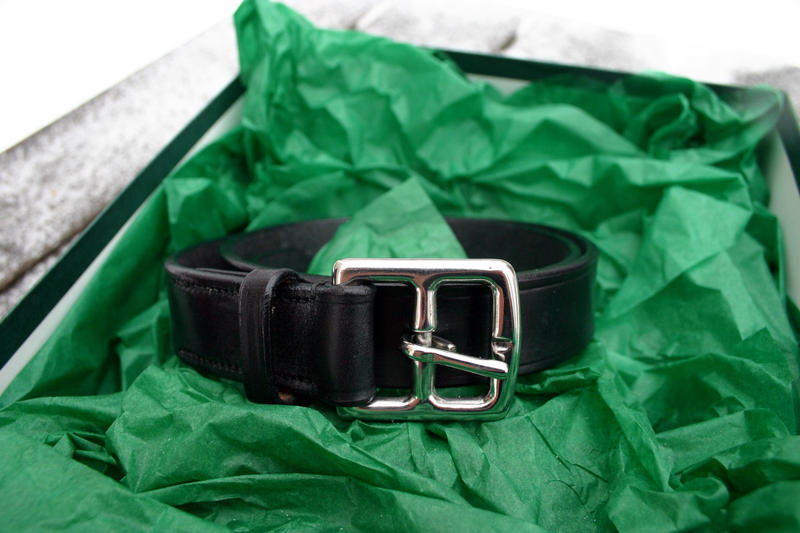 The color is as it should be, stitching is carefully done and the understated yet elegant buckle has a finnish you would expect from a stainless steel Fillis buckle. The Oak Brown belt is extremely beautiful. The color is vivid and already has what looks like beautiful patina. I would think this is due to the long process that comes with oak bark tanning and the leather used. The stitching shows beautifully in this shade of brown, and the stainless steel West End Roller buckle that was suggested to me by Charlie at EL looks fantastic. Lastly, a bit more of a "catalogue" shot that shows the both buckles, the wonderful handmande stitching and the color of both the leathers. The Oak Brown is in 1 1/4" and the black one in 1 1/8". As with my first EL belts, both of the new belts are quite stiff, which is a feature of a new belt made from this thick bridle leather. 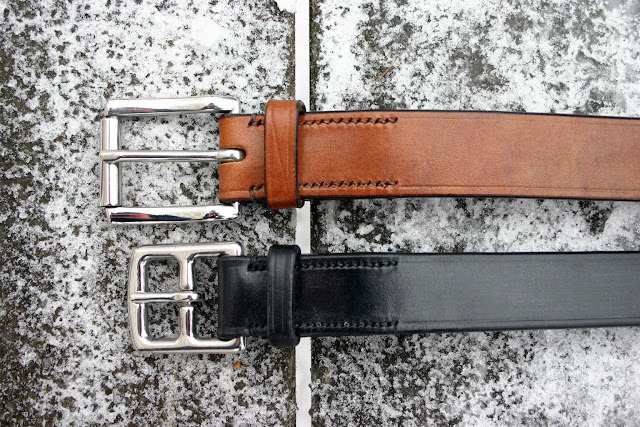 As with my first Equus Leather belts, I suspect they will get more flexier after some uses. Overall, I am very happy with these new products. 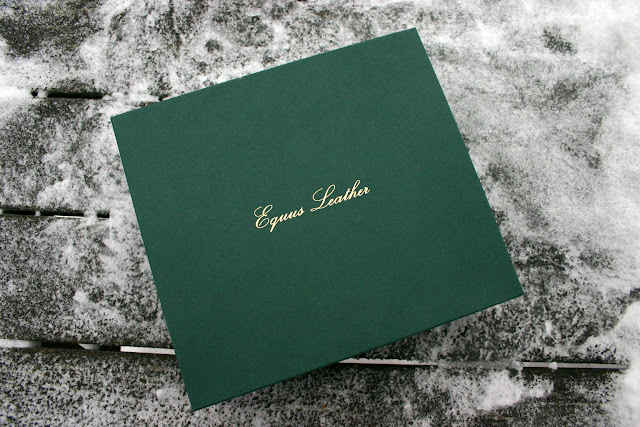 Equus Leather has always been one of those brands I've often recommended to my friends in need of a new belt that looks good and before anything, lasts. My next belt will be the new Dark Stain Harness oak bark tanned bridle leather that's also been recently added to the leather selection. Hi again B, and thanks. The brown one is certainly a beauty (wearing it right now actually). Can you buy them online? Greetings from Norway! There's an article in one of our biggest newspapers about fashionblogs for men, and someone mentioned you in the comment section! Hey, yes, I think you already told me that on the separate "post" I deleted. Thank you. 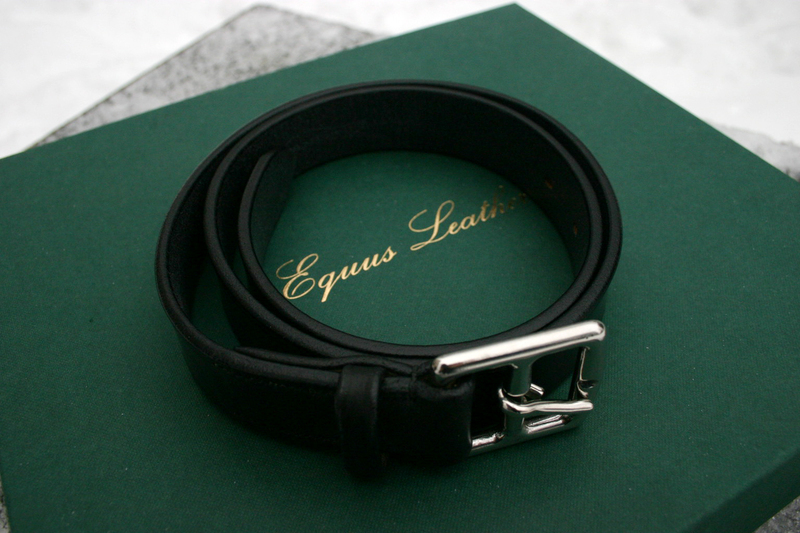 On a different note, if you are interested in Equus Leather's belts, you might want to like them on FB. They give out discount codes in there every once in a while. Anonymous who posted at 21:32, yes you can. Hey there! Ano2 is right, you can get your belts from equusleather.co.uk. You can see more of them in action on many of my posts. I wear one in almost every one, and some of them have a detail shot of the belt.